Erik Seidel is an 8-time World Series of Poker bracelet winner, owner of a World Poker Tour championship, and a Poker Hall of Famer, but in 2011 Seidel is angling to move from the poker elite into the realm of poker legend. With over $4.3 million in tournament winnings in 2011, Seidel has leapfrogged players like Jamie Gold, Phil Ivey, and Daniel Negreanu and finds himself sitting as poker’s all-time tournament money leaders –although there are now about two dozen different lists and variations, but for the purposes of this column I will stick with the all-time money-list at www.thehendonmob.com, using the all inclusive model. 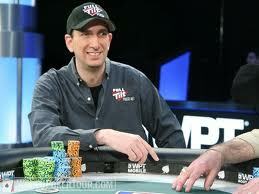 Erik Seidel; welcome to the Poker Legend’s club! This entry was posted on Wednesday, March 9th, 2011 at 7:00 am and is filed under Poker News. You can follow any responses to this entry through the RSS 2.0 feed. You can leave a response, or trackback from your own site.